When learning magic, it’s important to start with the basic fundamentals. 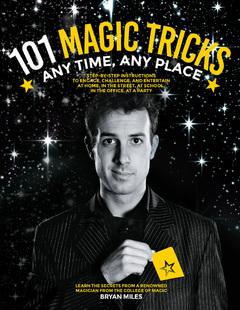 101 Magic Tricks shows you everything you need to know about laying a solid foundation for your tricks and effects. To accomplish the effects and sleights involving cards, wit will be important that you understand the basic terminology. Take a look below and familiarize yourself with the parts of a card. There are different theories behind the symbolism in playing cards, but here is one theory worth noting. The four suits—clubs, hearts, spades, and diamonds—represent the four seasons. The thirteen cards in each suit represent the thirteen phases of the lunar cycle. Fifty-two cards in a full deck represent the fifty-two weeks in a year. If you add up all the spots (including a joker) you get 365—the number of days in a year.